HOUSTON (KTRK) -- Deputies say it took a deputy, his Taser and K-9 partner to subdue a burglary suspect caught in the act. William Lee Williams is charged with burglary of a building and interfering with a police service animal. According to the Harris County Sheriff's Office, North Patrol District 1 canine (K9) supervisor Sgt. C Moore were dispatched Wednesday to call regarding a burglary happening at a business in the 16500 block of Hufsmith Kohrville. Sgt. Moore arrived at the scene as Williams was carrying out a box filled with merchandise he'd allegedly just stolen. Moore asked Williams to get down on the ground, but he refused and became billegerent. The final straw came when, according to the sheriff's office, Williams turned his body and hid his hand. 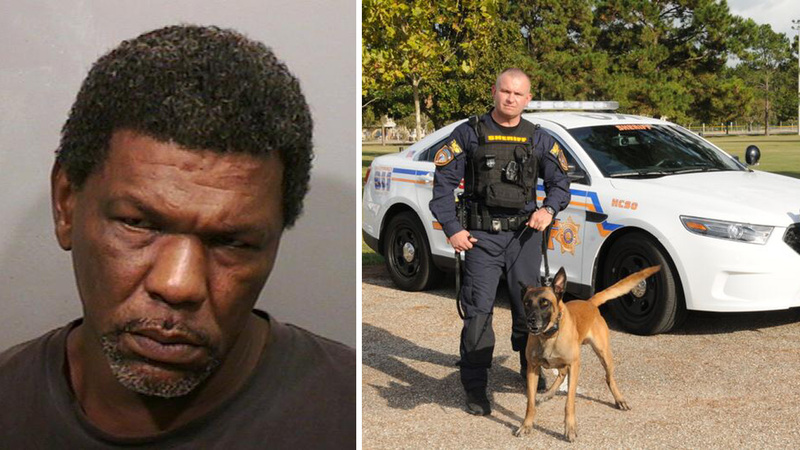 That's when Moore released his K-9 partner, Ziko, on the suspect. Deputies say Williams continued to ignore commands and started hitting Ziko on the head and kicking him off his leg. Moore then deployed his Taser and was able to gain control of the situation. Williams was treated at the scene for a laceration on his leg, but Ziko and the officer were uninjured.